Please join me in welcoming Juliana Kenny to the TMC news room and to the TMC team where she will be writing, editing and producing videos. Here is her first video which discusses the newly launched TelX Ethernet Exchange - which will allow carriers and enterprises to interconnect their Ethernet networks. This Cisco-powered service should be quite successful based on my early discussions with TelX customers as well as TelX executives. It is no secret that I have been hearing great things about the future of the optical market. Check out this post for optimistic interviews regarding the space with Hunter Newby of Allied Fiber and Jim Theodoras of Adva Optical Networking. Between the need for faster enterprise and consumer broadband connections and the need for more backhaul capacity to satisfy the needs of an ever-growing number of 3G and eventually 4G devices, the need for speed is real and consumers and businesses are paying for it. The new iPad 3G I just picked up with its corresponding $30/month connection should be a reminder to the skeptics of the insatiable desire for bandwidth on-the-go. For years, the tech industry tried to kill Ethernet with newer and more innovative technologies but Ethernet kept evolving to meet and exceed the challenge. In fact now the replacement of T1s and T3s with Ethernet is common. Although not exactly analogous, I always think of WiFi as similar to Ethernet in that it continues to evolve to take on technologies such as WiMAX, LTE and other next generation networks. Certainly anyone who has used a municipal WIFi solution which works well knows you can somewhat replace cellular providers in this manner. We have spent a considerable amount of time rearchitecting the TMC video site to be more friendly with Apple products which don't support Flash. Our solution has a few parts and for those of you who like video, here are some options. 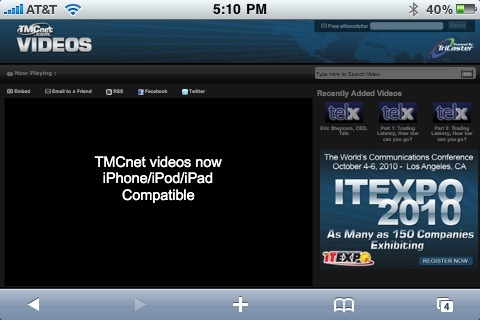 On an iPhone/iPod you can just go to i.tmcnet.com where you will be presented with a video option showing some of our more recently recorded videos as well as recent stories. We have an iPad 3G on order and will test this site out on the device when Apple releases it. Greenpeace has recently decided that going after oil drillers and coal miners is not enough and they plan to focus on companies they believe to be polluting by expanding their efforts into the data center market. More specifically the company recently chose to go after Apple and Facebook because of where they decided to locate their data centers. Greenpeace it seems prefers to have data centers located where there is less coal involved in energy production. Last month I spent some time discussing how social networking will impact your company on search engines. In this issue, it is worth discussing how these technologies are changing marketing, media and sales.